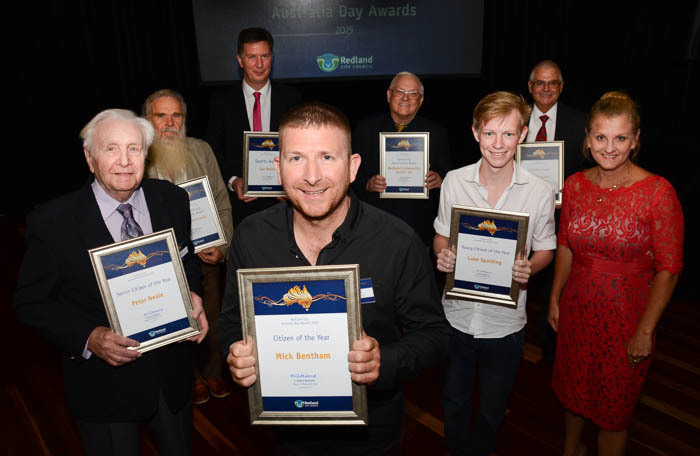 On Friday 23 January 2015 the recipients of the Redland City Australia Day 2015 Awards were named. Congratulations to the 43 award nominees, 28 award finalists and all award recipients. Photos from the event are available for download on our Flickr page. Five years ago Mick Bentham visited Nepal, where underprivileged children and filthy drinking water conditions gave him the passion to help change lives and make a difference. With hard work, dedication, dreams and aspirations, Mick founded The Bentham Foundation in 2012.The Bentham Foundation’s tag line appropriately reads “to create a ripple that affects a nation….starts with a single drop of affection”. Starting with a $10,000 donation, Mick’s dream of building a hostel to house 50 children became reality when the building was completed in March 2014. Mick’s efforts to help others – including Redlanders – haven’t stopped there. Last year Mick also spent time acquiring sponsors – many of them other generous Redlanders – to fund a child for $60 per month to cover housing, clothing, food, education and hostel running costs. To date he has found 36 sponsors and is always looking for more. Once a year Mick visits the hostel and plays soccer, shops for the children and colours with them. He intends to build veggie patches, chicken pens, and purchase goats for milk during his upcoming visit in March. Future plans for Mick and his Foundation are to not only extend the hostel but also build an adjacent Christian-based school. He is currently fundraising to cover the cost of the school land as well as the purchase and installation of bio sand filters to ensure clean drinking water and to prevent skin conditions and water borne diseases. Mick is also an avid support of community groups and charitable causes at home in the Redlands. Through his roofing business, Mick has supported a number of local causes including school chaplaincy, fundraising for domestic and family violence, the homeless and the Redland SES. He is also a driving force behind the Capalaba Business Improvement District. In 2014, 17-year-old Luke Spalding juggled Year 12 with doing wonderful things for the community. Luke devotes a considerable amount of his time and energy helping others, specifically sick children in hospital wards. Despite Luke’s own personal battle with cancer, diagnosed two years ago with a rare aggressive form of desmoplastic small round cell tumours, he dedicates much of his time to raising money to provide gifts to children with cancer in between receiving his own cancer treatment. Last year, he successfully put a call out to the community for fundraising support and quickly raised enough funds to buy 17 iPads – one for every child who spent Christmas Day in the oncology ward at Brisbane’s Royal Children’s Hospital. Luke, a keen motorsport racer, was the face of last year’s Redlands’ Relay for Life. With the enormous support from his family, Luke also participates in many other fundraising activities to benefit the community. William Peter Neale – known as Peter – is the President of the Cleveland Branch of National Seniors, an organisation that represents Australians aged 50 plus and is a powerful lobby force on issues such as retirement income, employment, health and aged care. Peter has been a member of National Seniors for 26 years, and has served on the Executive Committee for 21 years, 18 of those years as President. As President, Peter arranges weekly coach tours to clubs, theatres and shows at Twin Towns and Jupiter’s Casino, plus BBQs and picnics and sometimes extended trips away. The Cleveland Branch assists in reducing social isolation for Redlands seniors by holding a monthly meeting at the Redlands RSL for more than 100 members. While the Branch does not receive government funding, over the years it has donated in excess of $75,000 raised through fundraising activities including raffles back to the community through organisations that assist seniors. A former Airman, Peter has also been Deputy President of the RAAF Association Redlands Branch since it was formed in 2007. Ken Dickson is recognised for his outstanding service to the Redland community as a Volunteer in Policing (or V.I.P) with the local District Crime Prevention Coordination Unit of the Queensland Police Service. Based at Cleveland Police Station and working in all Redland suburbs including the Bay Islands, Ken became a volunteer in Policing in 2008 and has modestly performed more 5500 hours of volunteer service. His exceptional ongoing community leadership has previously been recognised with awards to outstanding service to the community including Gold, Silver and Bronze Service Awards for the VIP program. Ken’s expertise and ongoing commitment provides the Redland Community with the highest level of professional crime prevention and community safety support, advice and information. Ken recently arranged local presentations on scams, personal safety, home security and crime prevention at Council libraries and groups such as Rotary, Lions, Donald Simpson Centre and aged care villages. Ken is an admirable ambassador for the Redlands and continues to make his community, family and fellow members of the Queensland Police Service extremely proud. Last year, at only 10 years old, Alexa Curtis won Channel Nine’s The Voice Kids Australia, without having a single singing lesson before going on the show. She is now signed to Universal Music and has a new single – ‘Playground’ and has toured the country performing with The Voice Kids at local concerts. But she is always proud to be home in the Redlands, where she attends Redlands College. Alexa has not let the fame go to her head and sees herself as no different to any other Redland youngster her age. Alexa loves going to Nippers at the Gold Coast and taking tap, jazz and ballet lessons at Strictly Dance. Last year she wowed the crowd at the 2014 Redlands Christmas by Starlight concert singing with Luke Kennedy and Naomi Price. Alexa also featured in the 2014 NSW Schools Spectacular, performing with her Voice Kids co-stars, and duetting with The Voice winner Anja Nissen. Alexa is a name we will hear a lot of in the future, but will always call Redlands home. Allan Prestwood has been a resident of Russell Island for 10 years. He voluntarily gives the island community an enormous amount of his time for the betterment of the local community and environment. Allan has been a member of Bushcare on Russell Island for four years and is now convenor. Allan’s Bushcare work covers the whole island but in particular the Whistling Kite wetlands and Cavendish Street Reserve. During his time on the island, Allan has developed an extensive knowledge of local native plants and has taken a particular interest in identifying noxious weeds, shrubs and trees that are harmful to the island. He also lends his knowledge to local residents who want to clean up their own blocks by providing his knowledge and labour free of charge with the aim to revegetate the area with plants that will benefit native wildlife. Allan voluntarily picks up rubbish all over the island and on the bay – and in an environmentally-friendly way. He can often be seen riding his bike or paddling his kayak around the island to pick up rubbish from the mangroves and along the foreshore. Community members say they have never seen anyone dedicate more time to the care for the environment of Russell Island than Allan. After arriving in Australia from the UK in 2005, Ian Smits and his son joined a small rugby union club in Redland Bay called the Southern Bay Cyclones. At the time, the club was looking for parents to assist with coaching. Although Ian hadn’t played rugby since he was 15, he put his hand up to help……and eight years later, he is not only coaching the same group of boys, he is also President of the Club. Ian’s passion for the sport is evident. He has volunteered much of his own time coaching at various Redlands schools in the morning and afternoon and was also assistant coach for the Redlands District Team. He has conducted technique training every Tuesdays and Thursdays as well as video training on Sundays. Ian has the utmost respect for young athletes he coaches and this respect is given in return. Many parents have even asked Ian to help them if there has been challenging behaviour at home. He is often heard telling the boys “It’s about respect and discipline both on and off the field”. Since Ian was appointed President of the Club in 2012 he has put all his drive and energy into not only getting kids into the spirit but also improving the club’s facilities. Ian has been working non-stop in raising the awareness of these issues with local and state governments, Brisbane junior rugby union and Queensland Rugby. Recruitment is a major focus for Ian – to get local kids active as well as help increase club numbers. Ian personally delivers over 10,000 flyers to local schools for distribution. He also works with schools in putting the Rookies to Reds program in place and links sports teachers with Development Managers at Reds Rugby. Ian is also working on a program to help under-privileged kids into sport. Ian runs his own manufacturing business in the Redlands and despite being stretched for time, dedicates every spare moment to the rugby club and the Redlands Community.